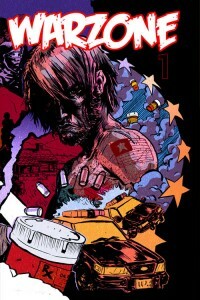 War Zone, from Bleeding Ink Productions, is an ultra gritty story revolving around an ex Iraq veteran named Johnny. Who has become a meth addict after returning home. When a drug deal goes bad, Johnny finds himself at war with local drug dealers and corrupt police. 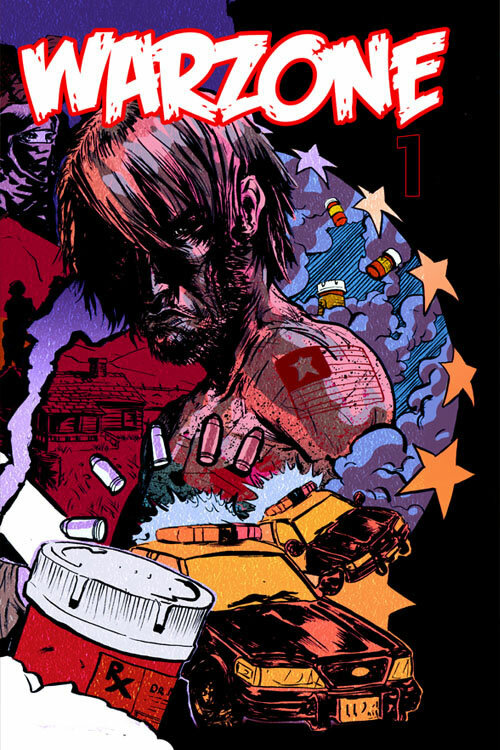 Haunted by flashbacks of the battlefield, Johnny, will not only have to battle the dealers, and cops, but also his own inner demons. The overall story arc and atmosphere has an old-school 70s grindhouse feel to it, a throw back to highly violent and grimy vigilante flicks. The grindhouse era has become the new thing to try to emulate, both in films and in the comic book world. While, War Zone, at first comes off as just another cookie cutter attempt at following the formula down to the smallest of detail, the end of the first issue adds its own twist, making it stand out on its own. Although, it is to early to tell rather or not the twist will be enough to sustain the series as something that differs from the legions of similar books, it has a fair amount of potential at success. The twist it self if used correctly could lead to a highly unorthodox, yet entertaining “buddy” dynamic, while not completely original, it could be just the thing needed to give the series that extra spark that brings readers back each issue. Overall, the debut issue is a fun read despite having countless moments of déjà vu, it does a good job at developing Johnny’s character and establishing him as the focus. The story also manages to escape its familiarity at the end, giving readers a reason to come back at least one more time. The writing succeeds at causing readers to root for Johnny and look past his current state of being, enabling them to see his inner self and understand his daily suffering. Will be looking forward to future issues, and seeing how the series pans out. Well worth picking up for fans of over the top violent action dramas, that focus on an anti-hero rising from the ashes to seek revenge. Drugs, crooked cops, gang bangers, bikers, its all here and accounted for, and if its your sort of bag, then you are sure to walk away with a smile on your face. Highly recommend reading with the soundtrack of the 1966, Peter Fonda, classic The Wild Angels, playing in the background for maximum effectiveness.